Keep all the toys and kid's clutter under control with this well-designed wall unit organization system. Simple clean white lines on the exterior minimiize the look of clutter while a multitude of colorful bins and boxes delight the family's children with a place to keep everything instantly accessible yet easy to put away. The extra long, bar style handles on the cabinets ensures comfortable access for both small children and adults. 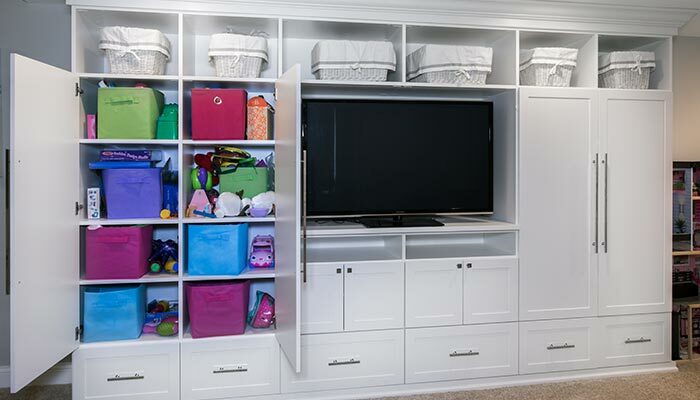 This custom playroom wall unit organization system is configured to hold a large number of toys and games — keeping everything clean and uncluttered in this kid's space — but still accessible for the family's children. Most importantly, all the toys are easy to store, encouraging the children to put their toys away when they are finished playing. 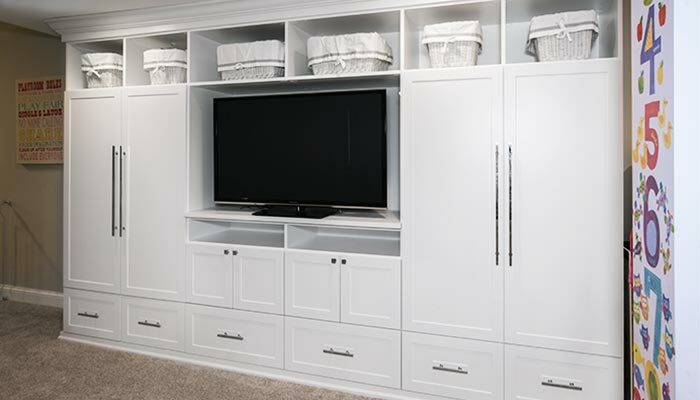 the smallest children are assigned the bottom drawers to hold their balls and play things, while older children can utilize the colorful bins kept behind closed cabinet doors to corral all the clutter.